After Kunimitsu we arrive right away at Rai Kunitsugu (来国次) who is listed, amongst others, as son-in-law of Rai Kunitoshi or as older cousin of Rai Kunimitsu (well, bearing in mind the then family system and situation of adoptions an so on, it is quite possible that actually both is true). As mentioned in the chapter on Rai Kunitoshi, Kunitsugu made some daimei for the master and we can assume that he also supported his cousin when the latter succeeded as head of the school. 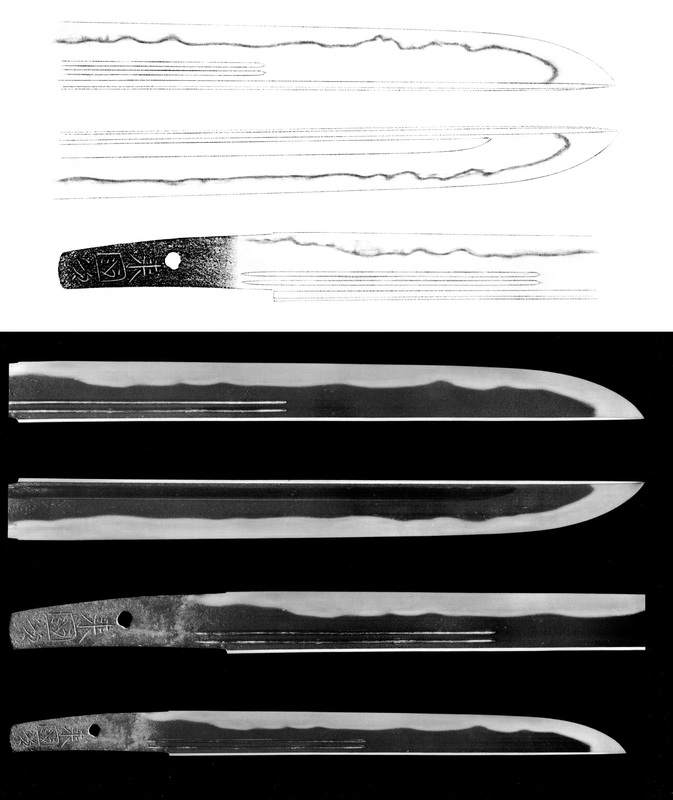 Interesting is that Kunitsugu deviated noticeably from the traditional Rai style and we can only speculate if he did so on his own initiative, finding himself in a situation where it didn’t make much sense for him – either in terms of artistic demands he placed on himself or order situation – to make exactly the same blades as his cousin, or if the school, i.e. the newly appointed Kunimitsu, made the conscious decision that Kunitsugu better meets the customer requests concerning the then very much thriving Sôshû tradition whilst Kunimitsu as head covers more the traditional Rai style. Anyway, dated works of Rai Kunitsugu are very rare and we only know a few from between Karyaku (嘉暦, 1326-1329) and Shôkyô (正慶, 1332-1334) but we can safely say that he was active at the same time as Rai Kunimitsu, and that is from the very end of the Kamakura to the early Nanbokuchô period. The Kotô Meizukushi Taizen says that Kunitsugu was born in Hôji one (宝治, 1247) and died in Shôchû one (正中, 1324) at the age of 78. It further says that he went in Bun’ei eleven (文永, 1274) at the age of 28 to Kamakura where he became a student of Masamune and that he returned in Kengen one (乾元, 1302), aged 56, to Kyôto. Well, there are now basically two theories about that: One says that it is quite possible that he indeed visited Kamakura to learn so to speak at ground zero the technical approach of the just established Sôshû tradition, and the other suggests that it was rather unlikely for a Kyôto smith of his time to travel that far just to undergo a training under a certain master and that the stylistic peculiarities in Kunitsugu’s blades go merely back to an all local adjustment to the now so much in fashion Sôshû tradition. Consequently, there exists the nickname “Kamakura-Rai” for Kunitsugu and this term is ambiguous enough not to dismiss it, i.e. it can be understood as a reference to him visiting Kamakura, or just as a reference to his Sôshû-influenced workmanship. Just the same case as Bizen Sukezane being called “Kamakura-Ichimonji.” Please note that the term “Sôshû tradition” is a rather recent one and that in earlier times, a reference to this style or approach of sword forging was usually made by its birthplace or major production site Kamakura, thus “Kamakura-Rai” and “Kamakura-Ichimonji” and not “Sôshû-Rai” or “Sôshû-Ichimonji” respectively. Before we continue with Rai Kunitsugu’s workmanship, it is also interesting to note that when talking about Kunitsugu, it is always said that he did not make many tachi and that he focused more on tantô and ko-wakizashi. But when we check out his body of work, we learn that the number of extant signed long swords is actually pretty equal to that of extant signed short swords and that there are actually quite a few ô-suriage mumei long swords going round that are attributed to him. For example, five blades of him bear designations by the Agency of Cultural Affairs, 1 kokuhô and 4 jûyô-bunkazai, of which two are short, and three are long swords. And way more than half of the about 50 jûyô of Kunitsugu are long swords too. So I have a hunch that the old saying that tachi of Rai Kunitsugu are so much rarer than tantô needs to be rethought. In any case, what we learn when we take a look at his body of work is that he focused much more on longer and wider tantô (or ko-wakizashi) than Kunimitsu did, even if he was senior to him. That means, this peculiarity can not be explained by him being active later than Rai Kunimitsu and thus approaching more the heyday of the Nanbokuchô period. Maybe this has to be seen in the above mentioned Sôshû context too, i.e. him adjusting much more to the latest fashions than Kunimitsu. Now to his works. First one of his tachi that is designated as a jûyô-bunkazai (see picture 1). It is completely ubu and has an impressive nagasa of 82.0 cm and shows the sugata from the late Kamakura period, i.e. it is wide, has some funbari, tapers, but not that much, has a moderate sori, and ends in a chû-kissaki. The kitae is a rather standing-out itame with plenty of ji-nie and some chikei and ô-hada. The hamon is a nie-laden gunome-chô mixed with ko-midare and a few sunagashi. The nioiguchi is wide and the bôshi is sugu and runs out as yakitsume. 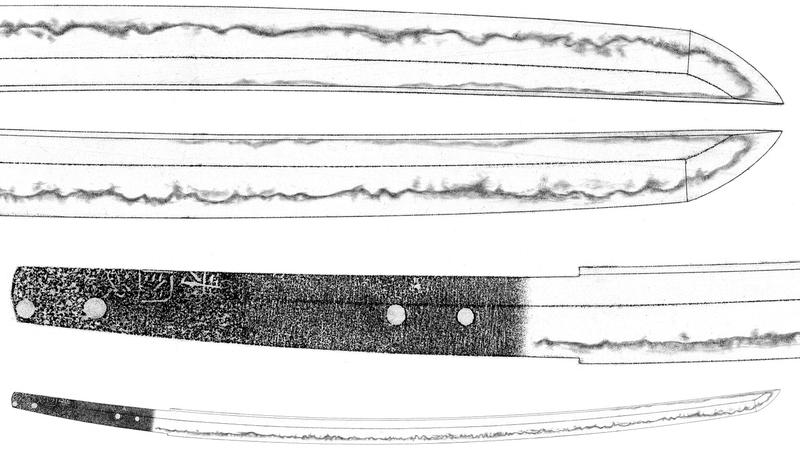 The overall interpretation is rather classical for Rai Kunitsugu and blades like this or such which are hardened in suguha-chô are often placed in his early period, i.e. showing the remaining influence of his master Kunitoshi. Another one of these supposedly early works is seen in picture 2. It is an ubu tokubetsu-jûyô tachi that is more on the elegant side and sticks much more to the traditional Rai style than his later interpretations. The kitae is truly Rai and appears as a dense and finely forged ko-itame that is mixed with some jifu, a few ô-hada areas here and there, and that features plenty of ji-nie, fine chikei, and a nie-utsuri. The hamon is a ko-nie-laden suguha-chô mixed with shallow notare, ko-gunome, ko-chôji, ashi, yô, fine kinsuji and sunagashi, muneyaki (towards the base), and nijûba along the monouchi. The bôshi is a thin sugu with a very brief ko-maru-kaeri. The ha is as a whole close to Rai Kunitoshi and I this would be a very tricky kantei blade. Although not as prominent as seen via his short swords, Rai Kunitsugu also had the Sôshû approach “slip” into his tachi. The blade seen in picture 3 is such an example. The tachi is suriage and although it keeps a relative deep sori, it is due to the lack of distinct taper and the compact, almost ikubi-style chû-kissaki of an overall rather stout sugata. The kitae is a somewhat standing-out itame mixed with mokume and shows ji-nie and a little jifu, and the hamon is a nie-laden mix of ko-notare and ko-gunome that features a noticeable amount of ups and downs, a bright nioiguchi, and an abundance of hataraki like ashi, yô, sunagashi, kinsuji, yubashiri, prominent muneyaki, and some tobiyaki. The bôshi is midare-komi with a ko-maru-kaeri that shows some hakikake and that connects with the muneyaki. The nie are pretty strong in ji and ha and the interpretation truly lives up to his nickname Kamakura-Rai. As just indicated, the Sôshû influence is more obvious at Rai Kunitsugu’s tantô and I want to introduce first his one and only kokuhô and his most famous work in general (see picture 4). 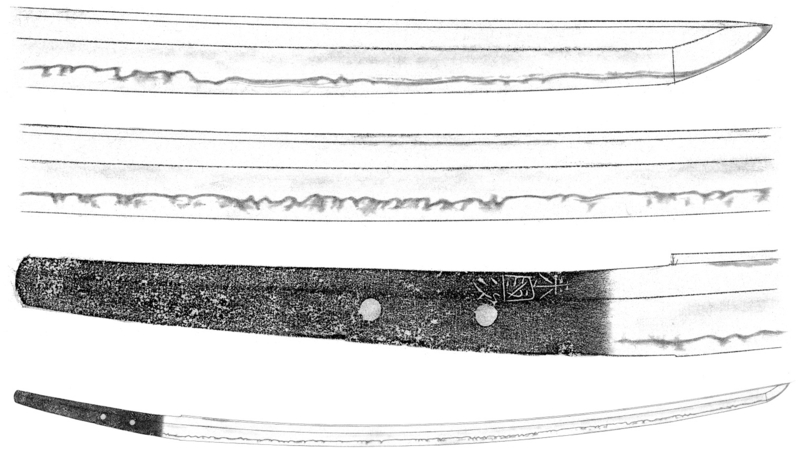 The tantô in question would actually come under the classification of a wakizashi today as it has a nagasa of 32.7 cm. So you can either name it sunnobi-tantô or hira-zukuri ko-wakizashi to transport that it is overlong and not one of those standard-sized (jôsun) tantô of the Kamakura period. It has a wide mihaba and might thus look like an Enbun-Jôji work at a glance but the kasane is too thick and the sori is, although there is sori present, too shallow for a blade from that time. Or in other words, at a blade in Enbun-Jôji-sugata, the sori would be much more noticeable. The kitae is a dense ko-itame with ji-nie and much chikei and here we have just arrived at a feature that distinguishes Kunitsugu from Kunimitsu and Kunitoshi, and that is the presence of chikei. So if you can make out chikei on a Rai blade, you better go for Kunitsugu. Apart from that, weaker Rai-hada areas are very rare for Kunitsugu but as the exception proves the rule, a hint of Rai-hada is actually present on that kokuhô. The hamon of this tantô or rather sunnobi-tantô is a very nie-laden ko-notare-chô mixed with gunome, nijûba, yubashiri, plenty of ashi and yô, and some kinsuji and sunagashi. The nioiguchi is wide, bright, and clear and the bôshi is a notare-komi with a somewhat pointed ko-maru-kaeri and some nijûba and kuichigai-ba along the monouchi. The interpretation of the bôshi distinguishes him from Rai Kunimitsu. As mentioned in the previous part, Kunimitsu emphasized his bôshi in contrast to the rest of the hamon in case of a midareba. In other words, at those blades he hardened in midareba, Kunimitsu added a so to speak “extra touch” of midare and “wildness” to the bôshi whereas Kunitsugu lets his midareba calm more down in the bôshi. And this “calmness” in the bôshi also distinguishes Rai Kunitsugu from “real” Sôshû works as these often come with wild bôshi that tend to ichimai or ichimai with enclosed islands of unhardened areas in between. In addition, also his jigane distinguishes him from true Sôshû because in direct comparison you learn that his jigane (and his ha) is actually much more Rai than Kamakura. So if you have a Rai blade from the very end of the Kamakura and the early Nanbokuchô period where the hamon is noticeably midare and comes with much nie, it is safe to go for Kunitsugu. Another good example for him staying much more at Rai with the jigane and having, apart from chikei in cases as mentioned above, the Sôshû approach mostly affecting his ha is the tantô seen in picture 5. Darcy put it perfectly in one of the recent threads on NMB by saying that Rai Kunitsugu was Sôshû influenced but he did not make Sôshû swords. That means, some might be called hybrid at a max but in general these blades were not made from scratch by following the technical Sôshû approach of steel combination and treatment. So Rai Kunitsugu was basically sticking to the Yamashiro Rai approach of forging and had Sôshû influence his ha. The tantô seen in picture 5 is again wide and sunnobi, but with a nagasa of 27.4 cm not as long as the kokuhô. It has a thick kasane and only a hint of sori, so clearly no Enbun-Jôji-sugata here. The kitae is a dense and finely forged ko-itame with plenty of ji-nie and a nie-utsuri. The hamon is a relative widely hardened and ko-nie-laden shallow notare-chô mixed with some gunome, ashi, fine sunagashi, and nie-suji. The nioiguchi is wide, bright, and clear and the bôshi is sugu with a ko-maru-kaeri that tends a little bit to ô-maru on the omote side. Finally, I would like to mention that Kunitsugu sometimes also “went full Rai,” for example as seen as in picture 6. This blade has an about jôsun nagasa of 25.3 cm and a hint of uchizori and is thus, also with the curved furisode-style nakago, classical Kamakura. The kitae is an itame mixed with mokume and some nagare and shows plenty of ji-nie and although it features some chikei, the jigane is very much Rai-like, also due to the presence of a nie-utsuri. The hamon is a calm and ko-nie-laden suguha that is mixed with some ko-ashi, some fine hotsure, and a little kuichiga-ba on the ura side. The bôshi is sugu too and runs back in a ko-maru-kaeri with some hakikake. If you bear in mind this and similar tantô and also the tachi in suguha-chô that are extant by Rai Kunitsugu, it is not at all like day and night between him and Kunimitsu as some of the older sources suggest.